White Dial Temp Gauge fitted to your panel with all local wiring. Also supplied with the sender to replace the original one in your engine (if required). Temperature Gauge with engine fitting kit. 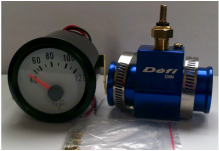 White Dial Temp Gauge same as left but with the fitting kit if your engine has no taping for the sender. White Dial Oil Pressure Gauge fitted to your panel with all local wiring. Also supplied with the sender to replace the original one in your engine (if required). 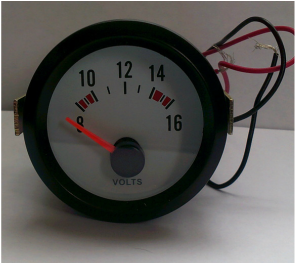 White Dial Volt meter fitted to your panel with all local wiring.